Hello Friends! Welcome to the Feb. ODBD Release!!! I think you are going to fall in LOVE with this release! Before I tell you about my card, let me just give you the details on how you can win some stamps! For this card, I wanted a very vintage feel, and a place to tuck in a little message, so I created a pocket card. I stamped the Flourish heart with ColorBox Bronze ink and die cut with the largest heart in the Custom Ornate Hearts Die set. I used a base of cream, added my designer paper, then the large heart. On that I matted an old postcard that I found in my Mother in Law's things when we cleaned out her apartment before she went in to a nursing home. It is so cool... it's actually a change of address post card from the PO, and it has "place one cent stamp here" on the front. I don't know when post cards were 1 cent but that's how old this is and it really tickled me. There were only a couple so it was hard to ink it, but I do love how it feels on this card, and I added some texture to it by embossing it with a heart border from a Sizzix ATC folder. Under the post card I placed some "paper lace", using the new Beautiful Borders die cut. I added one tiny heart where the one cent is to go, also die cut from the Ornate Hearts die set. On top of all that is my pocket, created with pink vellum behind the lacey die cut from the Ornate Heart Die set. I stamped one sentiment on the post card, and one on a tag, cut with the ODBD Custom Recipe Card and Tags die set. Everything is sponged with Distress Ink to antique it a bit. For my second card, I went a little more masculine.... or at least that was my intention. The card base is 5 x 5.5" and then I popped up in tent topper style another panel, so the card would get mailed in a 5 x 7 or 6" square envelope. 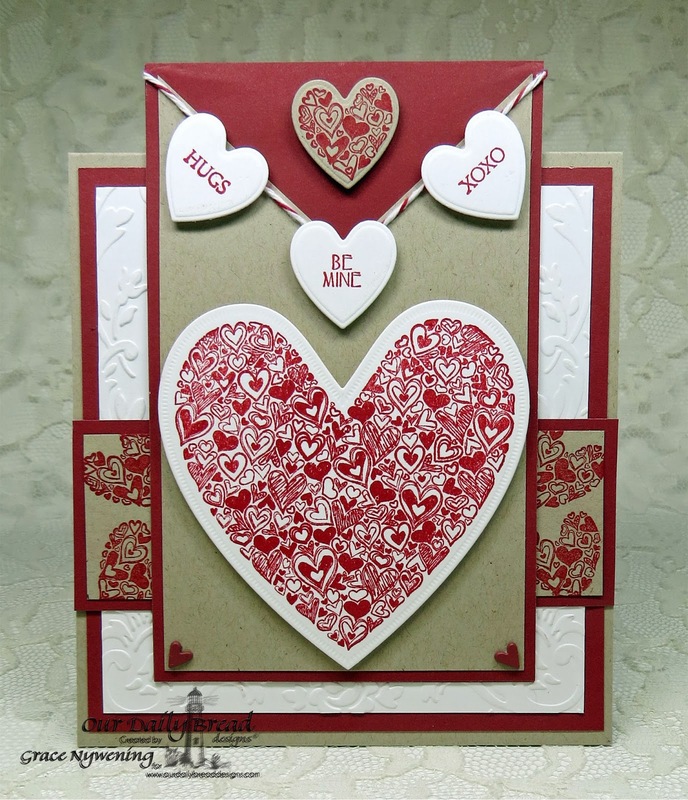 The hearts are stamped with Real Red and cut out with the coordinating ,Ornate Hearts Dies. The largest heart is from the Heart of Joy set. The little hearts are all cut with a smaller die in the Ornate Die set, and I stamped little sentiments that reminded me of conversation hearts (from Be Mine and Clean Heart sets)... but I "hung" them in banner form from the twine. I stamped the smaller heart design several times to make the background for my horizontal panel, and added one to the top.... also cut with the die.I decided to keep it clean and unfrilly so it could be used for a guy. To see the full release and lots of inspiration in one place, please see THIS POST on the ODBD Blog! Grace, these are both so amazing!! The vintage look, gorgeous colors and papers, and all of the beautiful details of the first one make me want to stare at it all day! I love the fun design of the 2nd....it could definitely work for a masculine card. Fabulous work as usual! HUGS!!!! Gorgeous vintage card and I like the conversation hearts on the second one. Absolutely gorgeous, Grace. I love vintage and you captured the essence beautifully on your vintage card! These are both wonderful little works of art! These new stamps and dies are some of my favorites yet from ODBD! Grace, these are so beautiful. You can just feel the love coming from them. I couldn't agree more with the other comments! B.e.a.u.t.i.f.u.l. Oh Grace - I wish I could spend a day watching you create - what a beautiful time that would be :). Your cards are always amazing but this first one is extra special!! Love all your beautiful details - so creative with the postcard keepsake - I can't stop looking at! And the second is so perfect for a guy - I love it too!! You are so talented Grace!! I am in awe of you. These are both beautiful but your first one takes my breath away. It is absolutely stunning!! So much eye candy and detail put together in pure perfection!! I just love the added postcard and that gorgeous ribbon paired with those fancy dies. Love it!! Have a great weekend sweet friend!! These dies and stamps are so nice! I LOVE the large hearts - the stamped one with lacey cut border & the way you inserted the center cut-out into the frame on the second - lovely looks. (and real interesting post card, too!) Such a different feel for the second card - but nice, too. Thanks for showing us what these stamps and dies can do! Truly elegant! Love the details and the string of hearts on the one card. Wonderful cards! Love the post card, it blends in well with your vintage theme. Your masculine card is fabulous. Thanks for sharing. Vintage flair sweet Grace, you have that talent and I adore it. These are both fabulous. Now you know I am leaning more towards the second as my favorite with the clean cut lines and design. ;-) yet I love them both. Beautiful detail work as always and wonderful cards. oh Grace! what a feast for the eyes on your first card! a Victorian beauty and oh-so-special too!! wow! a perfect guy card too!!! those seem to be hard sometimes! Oh, Grace! Sigh! I love both of your cards, and I agree with Chris! You are so talented and have such a wonderful style! I love all the details and your description of your first card! How precious about the 1-cent postage stamp! I just love how it all is layer out in your pocket...filled with loving things! And your second card is such fun, and I love the "banner" of hearts above the main heart! All such a delight to see and inspect! Absolutely beautiful, sweet friend! Wow, your cards are stunning! Love them!! Thank you so much for the great ideas! Awsome !! I love the red hart banner on white. So pretty. Thanks for the inspiration. Good Afternoon Grace, you have such beautiful cards and I just love your style. Both the cards are so awesome. 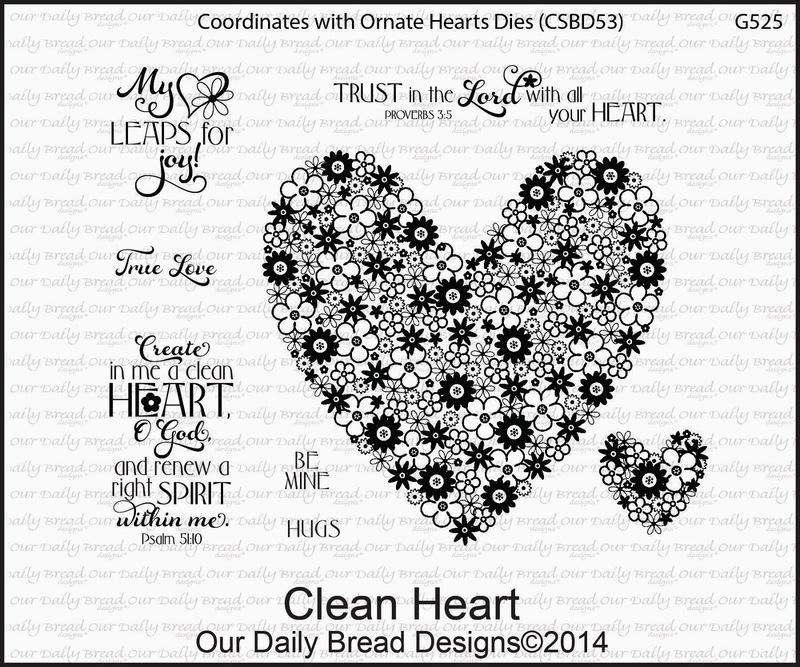 I love the Our Daily Bread Designs all of it. They have so much to pick from. Grace you have out done yourself this time.Thank you for sharing your cards and ideas with us, Have a Sunshine day. Beautiful, Grace! I adore your first with its fabulous vintage feel and colors. That postcard addition is wonderful! And I love your second w/ the striking red/white combo and little string of hearts. Wonderful artwork on both cards, Grace! Love the designs on both. These are such lovely cards!I really love the first one-that kraft post card is so vintage and the rose colored ribbon is beautiful! I love both of your cards and both design layouts. 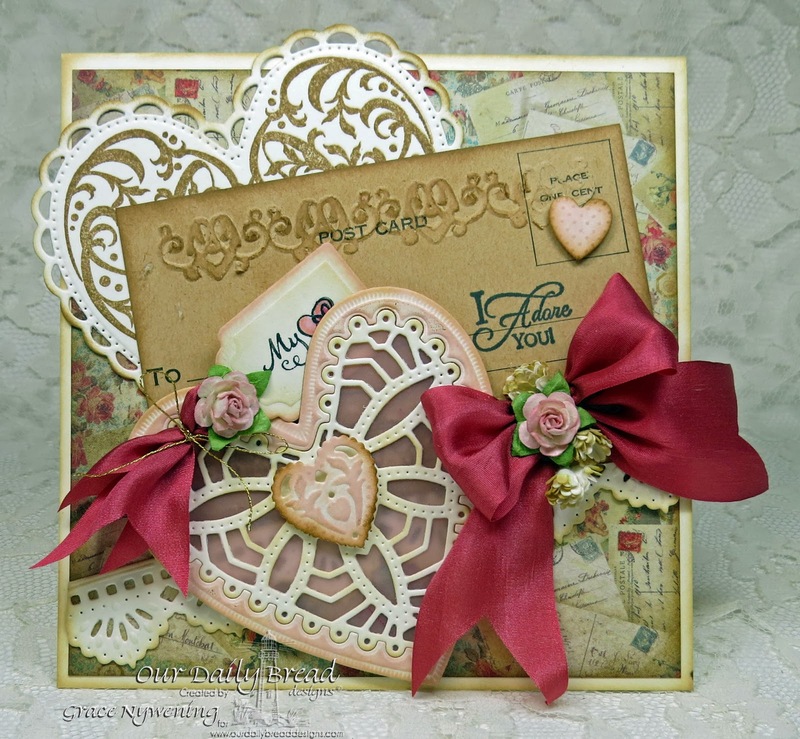 Beautiful heart die and love the sentiments and fabulous new stamps. Gorgeous! I"m jealous! I color and sometimes contemplate doing a card. Just adore vintage. Beautifully done. Any man would appreciate the second card. Nice job on both. I'll let my better half do the cards. She is better at it, but I'm still jealous. Smile. These are great...when I first noticed the postcard said place 1 cent stamp here I figured it must be a digital image...too funny that it's a real one! Lovely cards. I just love every one of your creations, sweet Grace! The first Victorian beauty is my favorite…I just love all the little places to tuck a special note and all the glorious details. What a wonderful masculine card…those are so hard for me, but your red, kraft, and white design is perfect! Hugs! Pretty cards!! 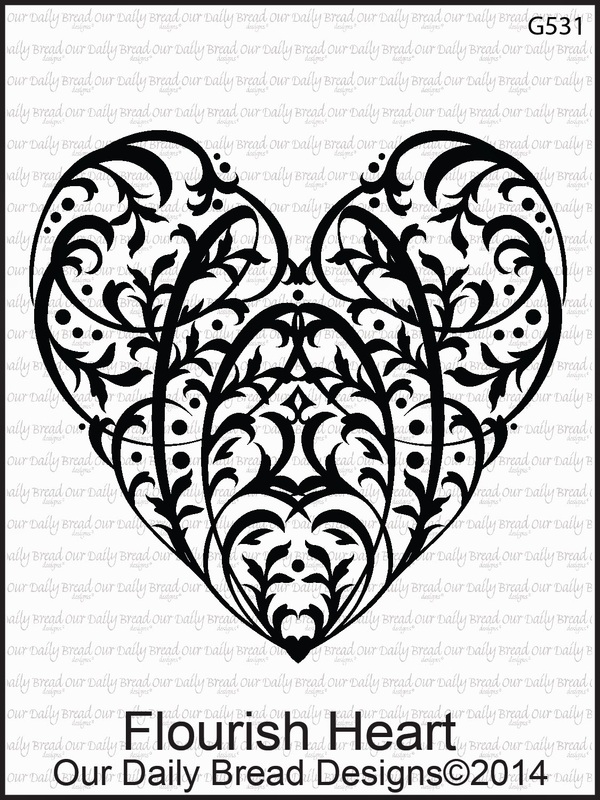 I really like the Flourish heart with the lacy border heart die that you made. 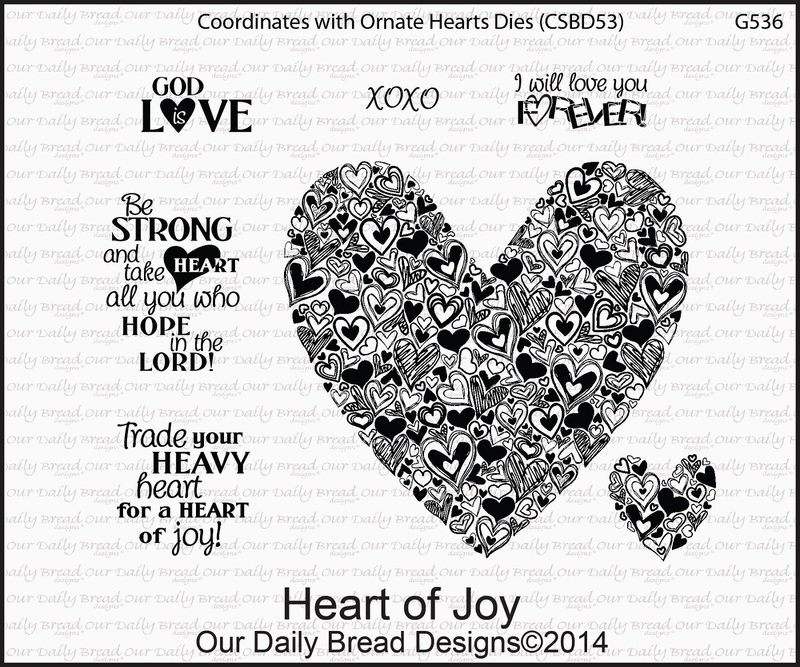 What a cool, large, versatile set of new heart dies! Grace your creations are amazing...I am in love with the new releases and definitely have them on my "must have" list! 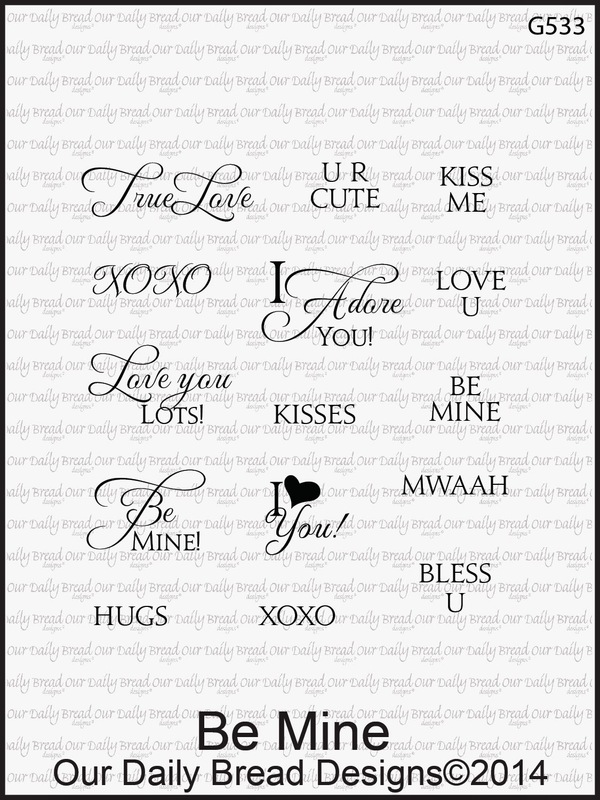 Sweet design and stamping of the sentiments on the smaller hearts, pretty stamping on the background piece too! Stunning cards. Especially love the red card with all the hearts. I'm always in awe of your talent for combining beautiful details! That first one with the vintage postcard from your MIL is SOOO special and so stunning! Love the tent style card as well...just gorgeous! Amazing and stunning cards! I love the first one.. it has that shabby chic look which I love. Your cards are always gorgeous! Your second card is perfect for a man, great job! Such beautiful creations. I especially love the lightness of your first card! 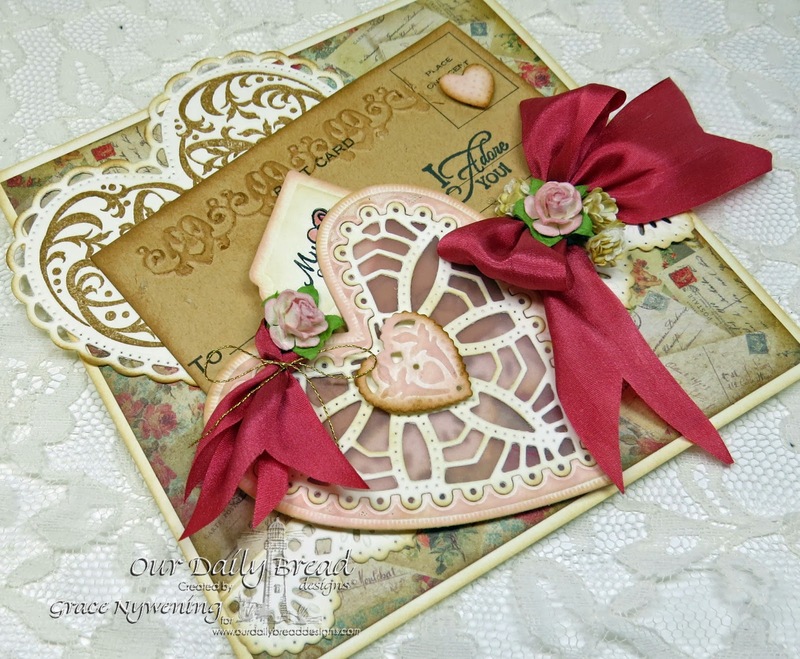 Grace, the vintage card is one of the prettiest cards I have seen from you..it is gorgeous!!! The 2nd is so cute, love the design. Gwen, I am so fond of the Victorian look that I really love your first card. You talked about the postcard belonging to your MIL. It would be wonderful if it could be HER valentine this year! Beautiful job. Both cards are so gorgeous. Well done. Wow Dawn! Your Victorian card is exquisite! Such eye catching details and textures! Your artwork is always creative and always inspirational! Love your work. Especially love the different elements you used on the top one. Beautiful beautiful vintage! I love the card and ribbon/bow. That's a sweet story about the post card too. Your second card is also very nice with the cute hearts 'hanging' on the twine. Thank you for sharing your creativity. Grace you've done it again, but that doesn't surprise me. I love looking at your creations and think about how I could get some of your ideas to work for me. These are stunning! These are such gorgeous cards. Love all the details and the color combos!! wow..Both of these are gorgeous Grace. Lovely samples for a gorgeous set. OMGOODNESS! Grace these are so gorgeous! I especially love your vintage one! You know how much I adore vintage! And your 'masculine' card is perfect! Amazing projects my friend! I LOVE the vintage feel of the first and how clever to use the ephemera!!! The die work peeking out... soft colors... sigh... BEAUTIFUL! And that second gem... I love the bold colors and beautiful design! OUTSTANDING! Oh..these are two gorgeous cards! Love the vintage touch on the first and the fun layout on the second :) !!! Beautiful cards Grace! Love the vintage one, fabulous showcasing of the new stamps and dies!